It is with great sadness that we received the news of the death of Father Joseph Hirsch, the Dean of the Holy Transfiguration of Christ Cathedral in Globeville. 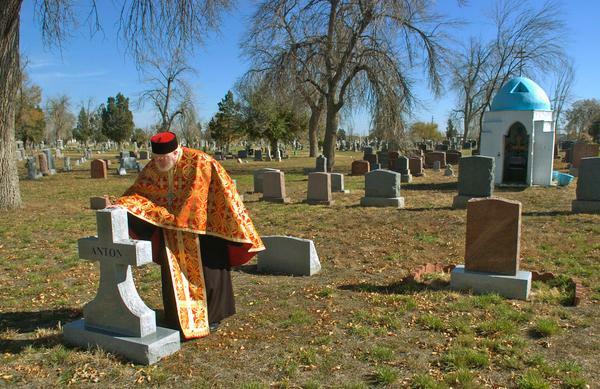 Father Joe was a fixture at Riverside, whether conducting a service or tending to the graves in orthodox section of the cemetery. Father Joe, along with his wife Paulette, has long been a tireless advocate for Riverside, for the congregation, and for the Globeville community. Both Father Joe and Paulette have supported the efforts of the Friends of Historic Riverside through their advise, their membership in our organization, and by allowing our group to use the community hall at the church for our annual meetings. Among his other accomplishments, Father Joe was the driving force behind the Orthodox Food Festival and Old Globeville Days, held in Argo Park just across from the church, an event that uses the best food at any festival in Colorado to bring visitors to their neighborhood. Father Joe was also a regular at community planning meetings, and could be counted on to advocate for a neighborhood that has been too often overlooked in the planning process. Though he was a fierce fighter for causes he believed in, he engaged each person with a unique combination of humanity and kindness. Our deepest condolences go out to Paulette, the Hirsch family, their friends and the congregation of the Holy Transfiguration Cathedral.